Our Englana® Heritage Leathers are all beautiful natural full-grained hides which have not been sanded or buffed in anyway and so will display surface markings, wrinkles, scars and variations which are individual to each hide. This is part of the beauty of the leather, it is these very characteristics that make each piece totally unique. Our leather with its natural full grain, has a wonderful smooth surface which is then coloured only with vegetable dyes – free from surface coatings of polymers and pigments that can be found in other low quality types of leather. Englana® leather is a waxed leather with a satin finish and over time you will see the wax character of the leather age as the tanning oils evaporate from the surface and your bag develops a lovely patina with a gentle sheen. Your Englana® investment is a lifetime piece and we have some TLC tips for you to keep it looking it's best. Every now and again, dampen a clean cloth or sponge in water and gently clean the surface of your bag. You can also use a little gentle liquid soap in the water but do remember to wipe over the bag afterwards with soap free solution to finish. 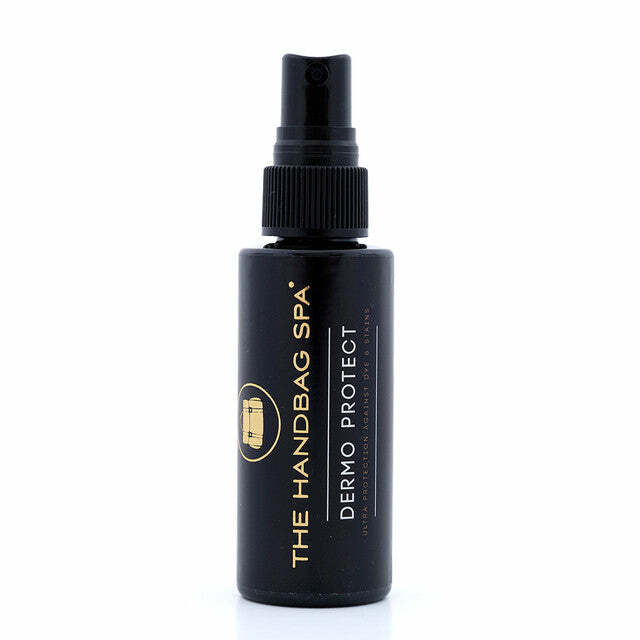 Dermo Protect is what we all need to prevent those handbag horrors from happening. We all know how awful dark handles can look, and how unsightly the dark blue hue of denim dye transfer can be. Dermo Protect is the solution! It has been specially developed to offer protection for all leather. Not only that but it will also stop problems such as rain marks and liquid staining such as red wine and coffee. This product can be used on a new Englana bag and keep it looking its best for years to come. Dermo Protect is so much more than a typical water proofing spray that can ultimately dry out your leather and not prevent problems such as grease and dye transfer. This is a water based stain guard product designed by the worlds finest leather chemists. Dermo Protect only needs to be used once every two months. Remember this product is not a prevention but it is a cure. What it is doing is protecting your leather from absorbing harmful substances such as dye, oil and liquids. If any of these come in to contact with the leather they will need cleaning off! If this product is used correctly then you will have no problem cleaning off any of these handbag disasters! Dermo Protect will darken unfinished leathers but it will dry back to the original colour not altering the look, feel or finish in any way. Caution: Keep product away from children. Possible irritation to skin and eyes. If product gets into eyes, rinse thoroughly with clean water and seek medical advice. Give your Englana® bag the treatment it deserves. Be prepared for those emergency spillages and eliminate nasty bacteria that bags can pick. These wipes are great for giving handles a clean and removing that dirt build up on linings. Suitable for: ALL types of leather and fabric. How to guide: Open sachet, remove wipe and massage on to your Englana® bag. Make sure you do a full panel at a time. Safe to use on all types of leather and fabric. May darken unfinished leathers but will dry back to original colour. 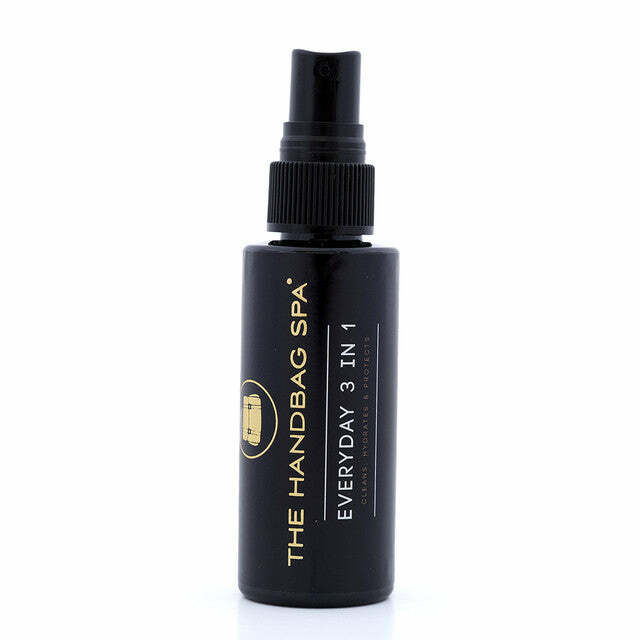 Everyday 3in1 product is perfect to use regularly on your Englana bags. It is a cleaner, protector and hydrator all in one easy to use spray. This water based product will clean off light day to day dirt build up on leather whilst topping up a layer of protection on the surface of the leather to prevent problems such as liquid staining occurring. For best results use in conjunction with Dermo Protect to get the ultimate protection for your Englana leather bags. How to use: We recommend you use this product weekly on your Englana bag to ensure it stays looking it's best. Simply spray on to a clean cloth and apply to the surface of the leather making sure you apply to a full panel at a time. This product WILL darken unfinished leathers, it will dry back to the original colour not altering the look feel or finish in any way. You can obtain Hide Cream which will help to keep it supple and replace some of the oils lost with everyday life. However, this is not necessary in the first six months to twelve months of the bag's life. Try smoothing the scratch out by rubbing and use the warmth of your fingers to bring the waxes up to the surface and so fill the scratch. Vegetable-tanned leather typically has no dyes and so exposure to rain and prolonged exposure to sunlight should be avoided. If the article does get wet, please wipe off excess water with a soft, clean cloth and allow it to dry naturally away from direct heat. you have possibly noticed that a single raindrop stains a vegetable-tanned pair of boots or piece of luggage. As it dries, you will notice that the water leaves a stain. This is no tragedy - with time and use, the leather develops a handsome broken-in look. Once you have allowed your vegetable-tanned leather to dry, you may apply a protectant to keep it waterproof and stain resistant. However, you need to use a protectant that is formulated to seal the leather but still allowing it to breathe. This is vital, because leather that absorbs no moisture will simply dry out and become brittle. Due to the natural properties of this leather there may occasionally be some colour transfer so please take care when wearing placing dark coloured leather next to light coloured clothing - particularly when the leather is new and/or the weather is warm. Please note: All the natural leather (light coloured leather) we incorporate in the "Goodrich Collection" is totally natural and totally un-dyed. It has had only oils and waxes applied for suppleness and strength and the colour/patina of this leather will evolve and change over time. It will begin as a very pale, cream colour but time and sunlight will gradually make this part of your bag darken in shade until it becomes a wonderful nut brown. When not in use we advise that you store your Englana® bag in the cotton dust bag provided. This will help keep dust and dirt off your bag and also keep light away, which can impact in the product colour. It is a good idea to fill the bag with stuffing to help it keep its shape and prevent any wrinkles and cracks. A couple of packets of desiccants, like silica gel, prevent dampness from ruining a bag. Air out the bag periodically and always store leather bags in cool, dry places, and in containers that allow air flow. Plastic bags or containers should not be used.